The horse's hind legs are what we should be looking at to asses genuine progress in training, not the head-carriage. 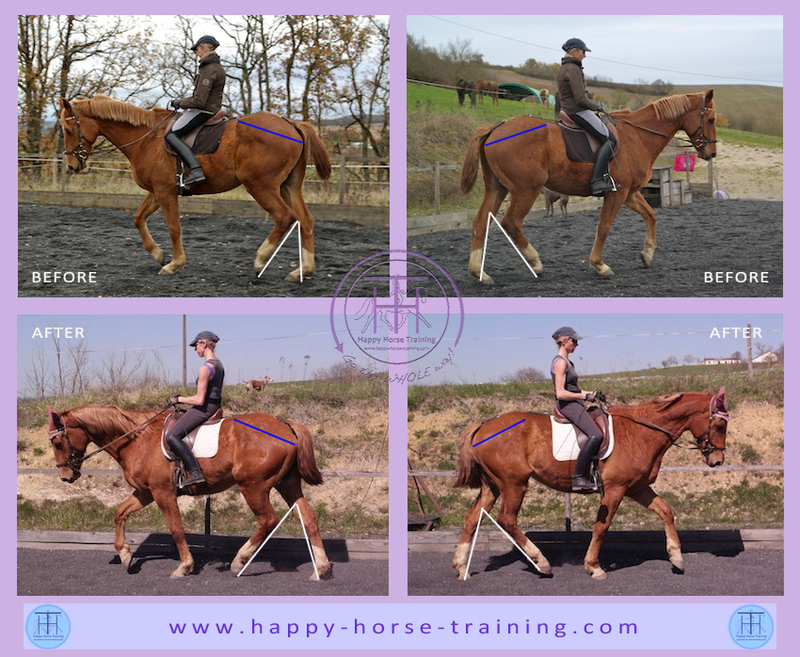 This comparison shows a young horse at an early stage of training (top images) and four months later (lower images) after several periods of work in postural engagement interspersed with periods of rest. Despite already being trained and competed in Eventing, his postural strength had not been developed in his early training, resulting in a very weak hind leg engagement and several 'evasions' based on this weakness, such as leaning on the bit. The white lines illustrate the angles separating the hind-legs at the same moment in the stride. In the 'before' images, this angle is smaller, as the lifting hind leg was not carrying forwards underneath the ribcage, and the extended hind leg was not pushing off as strongly. In the 'after' images, the angle between the hind legs is much greater, and the lifting hind leg is carrying forwards beyond the level of the stifle to reach underneath the ribcage. The blue lines show the angle of hip to point of buttock, indicating the engagement of the pelvis. Although this is a more subtle difference than the hind leg angles, the pelvis being a structural element of the anatomy, the angle is distinctly steeper in the 'after' images, indicating a greater tucking of the pelvis, to accompany the further-reaching hind legs. It is important to note in these images that in both the after images, the horse's head-carriage is lower, and could be misconstrued as 'less advanced' than the head-carriage in the 'before' images. In fact, the lower head-carriage is absolutely correct for this horse's level of engagement (even when the nose comes slightly behind the vertical), and it indicates a greater 'throughness' from the increased engagement of the haunches, which manifests as more softening and stretching towards the contact. If we were to look at these images and fixate on the head-carriage alone, it would be easy to mistakenly conclude that the horse is more 'on the forehand' in the lower images, and that the work is less advanced, but the hind legs tell another story. This is why we must pay attention to looking at the whole horse when analyzing work visually to avoid being fooled by the eye-catching appearance of the front end. As this horse's postural strength gradually increases, for as long as he is trained on the basis of postural engagement, he will gradually lift up more in front, as a function of his ability to tuck his pelvis more and 'sit' on his haunches. At no stage will it be necessary to ask him to lift up in front in any way, or use equipment that encourages him to do so (e.g. a double bridle) because it is whole-body engagement alone that determines the horse's ability to lift up in front.